For the first time since the dissolution of the USSR and the restoration of capitalism in 1991, a strategic document of the Russian state has openly designated the United States and the NATO military alliance as threats to Russian national security. The document, “About the Strategy of National Security of the Russian Federation,” was signed by Russian President Vladimir Putin on New Year’s Eve. It warns that Russia faces “counteraction from the USA and its allies, which are striving to retain their dominance in global affairs.” It predicts that this will lead to further “political, economic, military, and informational pressure” on Russia. The document points in particular to actions NATO has taken since backing the February 2014 coup that installed a far-right, pro-Western regime in neighboring Ukraine. It cites the “intensification of military activities of [NATO] member countries,” the “further expansion of the alliance” into Eastern Europe along Russian borders, and “moving military infrastructure closer to Russia’s borders” as national security threats to Russia. The publication of such a document is a warning that preparations for war between NATO and Russia, a nuclear-armed state, are well advanced. In diplomatic parlance, a national security threat is a threat so severe that a state is prepared to use military force to suppress it, and the strategy document states that Russia reserves the right to use military force if other measures to “protect national interests” are ineffective. The Russian national security document amounts to an official recognition by the Russian state that its relations with NATO, and in particular with the United States, are in a state of collapse. 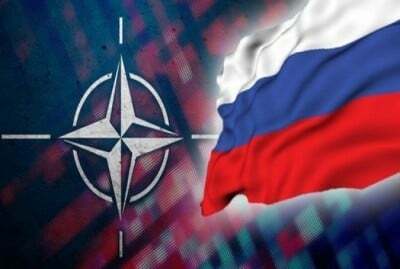 The policies pursued by NATO over the last two years signify that war between NATO and Russia is a real possibility. This was part of a broad build-up of NATO military power threatening Russia. NATO posted thousands of troops and warplanes in the Baltic republics, only a few minutes by fighter flight from the Russian city of St Petersburg. It has sent troops, organized military exercises, and posted missile defense units across Eastern Europe, and deployed naval forces on missions or exercises from the Arctic to the Baltic. The strategy document reportedly does not mention the Middle East, where NATO’s proxy war to oust Syria’s Russian-backed president, Bashar al-Assad, thus placed the Middle East and the entire world on the verge of all-out war. However, it is clearly a response to Turkey’s decision, endorsed by US President Barack Obama shortly afterwards, to shoot down a Russian jet last November over Syria, in a blatant act of war. NATO is making even more dire threats, however. Washington in particular has shifted to open preparation of aggressive nuclear war against Russia. Last year, US officials testified before the Congress that US forces are preparing for possible preemptive “counterforce” strikes with nuclear weapons against military targets inside Russia, before any attack by Russia took place. In its national security document, the Kremlin concludes that the NATO powers are seeking to overthrow the Russian government, on the model of “color revolutions” that produced US-backed regime change in countries like Georgia and Ukraine. It also warns that the NATO powers will seek to dissolve Russia. It lists “radical social groups which use nationalist and religious extremist ideologies, foreign and international NGOs, and also private citizens” among potential threats to Russian internal security and territorial integrity. The contents of the Russian national security strategy testify to the bankruptcy of the world capitalist system and amount to an indictment of the reckless policy of the imperialist powers. In an attempt to whip Moscow into line and assert their geostrategic interests in Eurasia, they are fueling a military escalation and an arms race that threatens to explode into a war that could claim millions or billions of lives. The response of Putin and the Russian capitalist oligarchy that emerged from the dissolution of the USSR is however bankrupt and reactionary. They are both unable and unwilling to make any appeal to opposition to war in the international working class. Desperately trying to maintain relations with the imperialist powers and their financial and economic resources, they oscillate between trying to cut deals with the NATO countries and threatening to defend themselves by fighting a catastrophic war with them. What emerges from the statements of the Kremlin and of Putin are the disastrous consequences of the dissolution of the USSR for Russia and the world. Surrounded by hostile NATO outposts in former Soviet republics in the Baltics, the Caucasus and Ukraine, devastated by the industrial and economic collapse that followed capitalist restoration in the USSR, Russia has been unable to rely on anti-imperialist solidarity that existed in the international working class with the USSR. The entire region has been thrown open to imperialist intervention, with catastrophic results. All this makes it easier for the NATO powers to threaten Russia with financial sanctions, trade penalties, and the partition of the Russian Federation along regional or ethnic lines. Above all, Russia is being confronted with the full brunt of the economic and geostrategic crisis of world imperialism. To the extent that the continued existence of the Russian state is emerging as an obstacle to the assertion of imperialist interests in the Middle East and Eurasia, it has become the target of ruthless military pressure from NATO. Significantly, Putin made dire warnings about the rising danger of war between the major powers in his remarks last year to the Valdai Discussion Club.